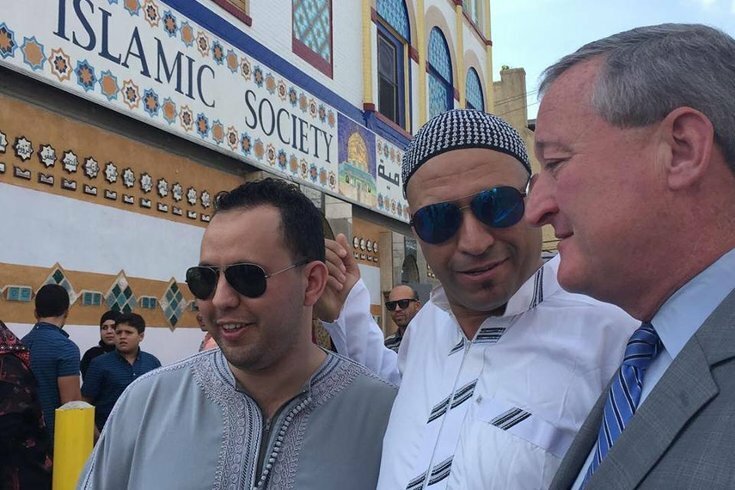 Mayor-elect Jim Kenney, pictured right, in front of the Al-aqsa Islamic Society building at 1501 Germantown Ave during a campaign stop in July. A mosque in Kensington was vandalized Sunday night after a red pick-up truck drove by and someone threw a severed pig's head on the property. Marwan Kreidie, executive director of the Arab American Development Corp., which shares the Al-aqsa Islamic Society building at 1501 Germantown Ave. with a mosque and a school, said the incident was caught on the building's security camera at about 11 p.m. Sunday. "This is the first time anything like this has happened," said Kreidie. According to Kreidie, surveillance video from Sunday evening shows a red pick-up drive past the building twice, and the second time, someone in the truck throws a severed pig's head out and onto the mosque's property. Kreidie said he has been working with local and federal authorities since the pig's head was discovered Monday morning. "They are investigating it as a hate crime, which it is," he said. Kreidie, said that the individual responsible for the incident must have known something about Muslim culture, as traditionally, pork is not considered halal and therefore not typically part of a muslim individual's diet. However, he said, the stunt was "ridiculous." "It's ridiculous, but they knew something. They knew this could be offensive," said Kreidie. Taking the incident in stride, Kreidie said, a pig's head left on a doorstep is sort of harmless, but he hoped any incident stops there. "Let's hope this doesn't escalate," he said. "It could be a bomb next time." Kreidie said he's working with local and federal authorities and he believes an arrest could eventually be made, because the mosque's surveillance video shows a clear image of the culprit, he said. "The footage is good," he said. "We've got good video." In a statement, mayor-elect Jim Kenney called the incident "bigotry" and said it had no place in a city that has a history of coming together to rise to challenges. "We cannot allow hate to divide us now, in the face of unprecedented difficulties," the statement read. "I ask all Philadelphians to join me in rejecting this despicable act and supporting our Muslim neighbors."